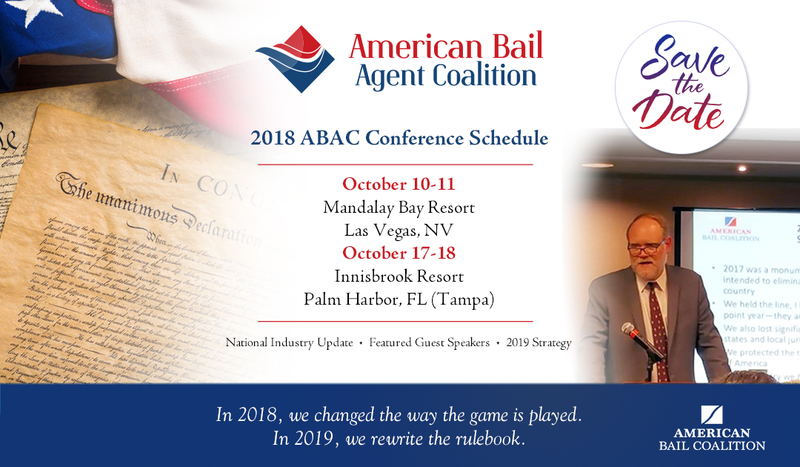 The American Bail Coalition is pleased to announce the 2018 dates for our annual agent conference – this year with two conferences! 2019 will again be a critical year for our industry and several new states will end up in the crosshairs of dangerous proposed legislation. With that in mind, we have decided to hold two conferences East and West to make it easier for our colleagues in bail to attend one of the conferences. Once again, we have selected Mandalay Bay Resort in Las Vegas for the Vegas venue on October 10-11. The beautiful Innisbrook Resort in Palm Harbor (Tampa area) will host our east coast conference on October 17-18. The conferences will be similar in content with different guest speakers at each conference. Come to one…or come to both! Our planning is happening now and we will continue the tradition of our affiliate conferences by packing it with the information that really matters to you in sustaining our industry and your business. 2018 ABAC Conference – Las Vegas!